My latest passion is visualization and personalization. There's a reason why companies like Airbnb and Nike have turned to storytelling when it comes to marketing their brand. I love studying what people desire, what makes them impulsive, and what moves them to change. There's more to marketing than advertisements and promotions. I've written case studies, press releases, bios, and award-winning applications for high profile companies. The script has been flipped a few times and I'm grateful for the personal exposure. I'm no stranger to exhibitions and conferences. Whether I'm working a company's booth, launching a new product to the world, or standing on the speaker's stage, I know what is necessary to make it successful from start to finish. I coordinated the partnership announcement and presentation between ParkHub and The Texas Rangers at Media Day, wrote the press release, and documented the event and official launch with a video crew. Exhibiting in Startup Alley and attending Techcrunch Disrupt is a rite of passage and a dream for many startups, and I had the opportunity to do my first one as Chief Marketing Officer of Sayfe in San Francisco at Pier 70! Launching the Chevrolet Cruze at SXSW was one of my favorite projects to work on. We unveiled the new model on the trade show floor with interactive QR codes, live social streams, and General Motor executive interviews. Shinola's challenge was to sell 2,500 pre-order, luxury watches in two weeks from a brand no one knew existed. Leading the digital media campaign, I helped bring $180K in revenue over 10 days. The first edition Shinola watches sold out in 5 days. We did a 20 day Twitter contest with CrunchGear, a subsidiary of Techcrunch, where we gave away a brand new Samsung Instinct to the winner who wrote the best haiku about it. 2,000 submissions and 1,000 new followers later, Instinct would flood the market. Here are a few samples of current and previous results from my professional and personal endeavors. Research, data analysis, testing, and optimization is the backbone of marketing strategy. Hard work and persistence pays off. I led the site redesign in Jan 2017 and leads per month surpassed 2016 by mid year. 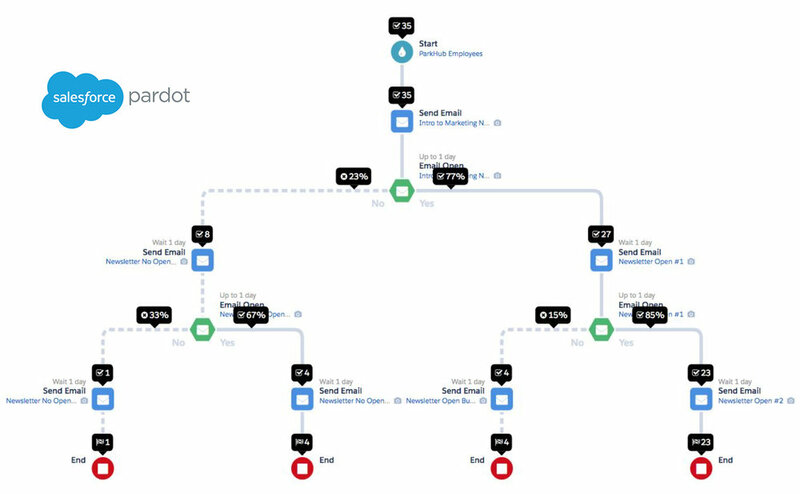 Salesforce Pardot's Engagement Studio is my weapon of choice for marketing automation and email drip campaigns. Other platforms I've worked with in the past include Hubspot, Mailchimp, Constant Contact, and SharpSpring.